My good friend Heathyr is going to be a mommy very soon, so I made these for her baby shower. Booties and a matching little hat. Aren’t they the tiniest things you ever saw? Awww!! 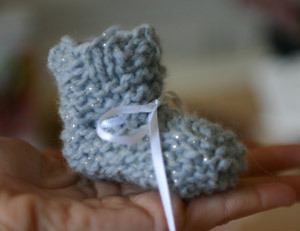 There’s something about little tiny shoes that get me every time. Too sweet for words!! those are so tiny.. aww.. I forget how small they are! Yes, and I tear up every time I take them out…what a wonderful gift for little James. Thank you so much! hehehehe those are soo cute! i was wondering if you sell any for baby shower favors?